is an event hosted by NYSVMS within the New York Vet show. Our focus is on engagement with current issues facing veterinarians in New York and all NYVet attendees are welcome. This event brings together veterinarians to engage in discussions around current issues. Our theme for 2019 is "Animal Welfare" and our goal is to increase the engagement of private-practice veterinarians with the work of their local community shelters. On the second day there is workshop to help build your skills at managing clients. 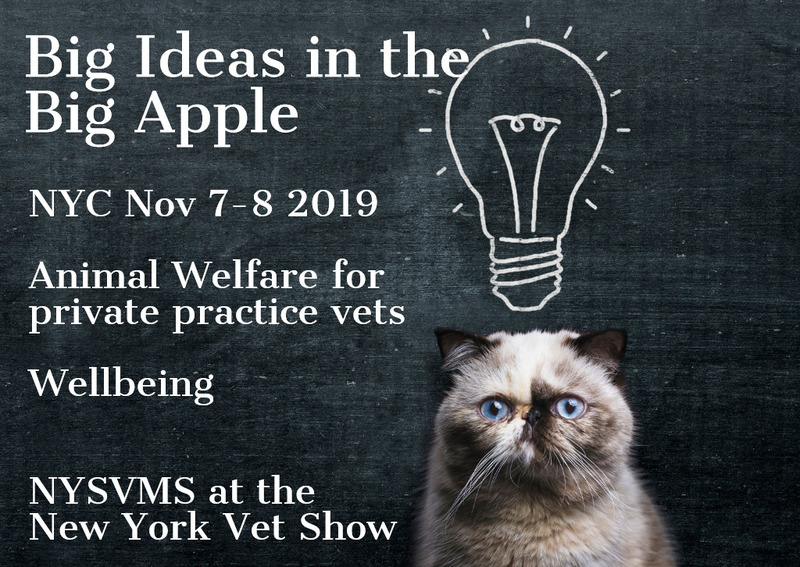 The event is held in one of the conference rooms within the New York Vet Show in New York City, and will be designed to provide an environment where you can both learn, discuss and explore issues with other veterinarians. You can drop into any session while you are attending the New York Vet Show, or join us for the whole program. A series of presentations and workshops to help you understand how the Animal Welfare system works, what to do when caring for abused or stray animals, and how to help your local community shelter. In the morning we will run a workshop on working with difficult clients so that you can reduce your workplace stress. The afternoon program will look at issues like debt and career development. NYSVMS members and their veterinary technicians can take advantage of the NYSVMS member discount. Use the registration link above to claim your discount.